Health care managers and students will finish this book owning a set of tools that can help them make economic-based policy decisions in the modern health care organization. With an eye towards the future, material is framed around emerging health care policy for the 21st century and how economics plays a crucial role in establishing policy. Readers will be introduced to principles of microeconomics and decision analysis as a way to approach resource allocation issues within the organization. The primary focus is on applied rather than theoretical economics. 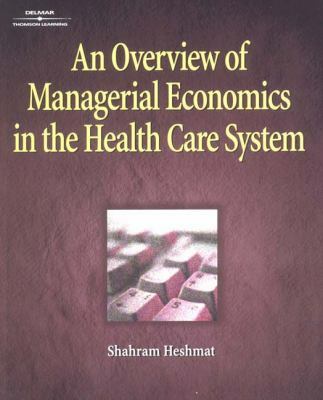 Key features: *Applied abstract economical principles to real world situations *Includes study questions and examples to improve understanding *Offers techniques for performing economic analysis *Presents material in context of emerging health care policy as of the 21st century (KEYWORDS: health service administration, HSA, health care policy, microeconomics)Heshmat, Shahram is the author of 'Overview of Managerial Economics in the Health Care System' with ISBN 9780766815285 and ISBN 0766815285.